Events from the year 1848 in the United Kingdom. 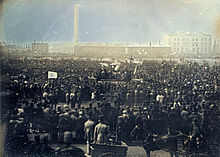 10 April: The first photograph of a crowd shows the Chartist Rally. 2 February – John Henry Newman founds the first Oratory in the English-speaking world when he establishes the Birmingham Oratory at 'Maryvale', Old Oscott. 15 February – The Caledonian Railway is opened throughout between Edinburgh, Carstairs and Carlisle, completing a through rail route from London by the West Coast Main Line and providing the first service of through carriages between Scotland and England. 17 February – John Bird Sumner is nominated archbishop of Canterbury. 24 February – Amid a revolt, French King Louis-Philippe abdicates and escapes to England. 29 March – Queen's College, London, founded, the world's first school to award academic qualifications to young women. 10 April – A 'Monster' Chartist rally is held in Kennington Park, London, headed by Feargus O'Connor. A petition demanding the franchise is presented to Parliament. 18 April – Second Anglo-Sikh War breaks out in the Punjab. 21 April–23 November – Chopin visits London and Scotland, his last public appearance on a concert platform being on 16 November at the Guildhall, London. 22 April – Treason Felony Act passed, reducing certain categories of capital high treason to felony punishable by penal transportation. May – Huddersfield workhouse scandal: an inquiry reveals the poor conditions in which inmates have been kept. 30 May – The Prudential Mutual Assurance Investment and Loan Association is established at Hatton Garden in London to provide loans to professional and working people. Great Famine (Ireland): Potato blight has returned and outbreaks of cholera are reported. Famine victims on outdoor relief peak this month at almost 840,000 people. Public Health Act establishes Boards of Health across England and Wales. 4 July – St George's Cathedral, Southwark, is opened as a Roman Catholic church, designed by Augustus Pugin. 11 July – London Waterloo station opens. 26 July – Matale Rebellion against British rule in Sri Lanka. 29 July – Young Irelander Rebellion at Ballingarry in County Tipperary is broken up by the Irish Constabulary. 19 August – Moray Firth fishing disaster: 100 fishermen lose their lives in a severe storm off the east coast of Scotland. 24 August – The U.S. barque Ocean Monarch is burnt out off the Great Orme, North Wales, with the loss of 178, chiefly emigrants. 26 August – The Plymouth Brethren split into the Exclusive and Open Brethren. 16 September – William Lassell independently co-discovers Hyperion, one of the moons of Saturn. 1 November – First W H Smith bookstall at a railway station opens, at Euston Station, in London. 23 December – A picture of the royal family gathered around a Christmas tree at Windsor Castle appears on the cover of The Illustrated London News (special Christmas supplement), popularising the custom of the tree in Britain. New Anglican sisterhoods founded: Society of the Most Holy Trinity (the 'Devonport Sisters' or Ascot Priory) is established by Lydia Sellon to minister to the poor in the seafaring community of Devonport and the Community of St Mary the Virgin is founded at Wantage. Cambridge rules for Association football drawn up. British, Dutch and German governments lay claim to New Guinea. The Communist Manifesto (Manifest der Kommunistischen Partei) by Friedrich Engels and Karl Marx (21 February). W. Harrison Ainsworth's novel The Lancashire Witches (serialised in The Sunday Times). Mrs Cecil Frances Alexander's Hymns for Little Children, including All Things Bright and Beautiful and Once in Royal David's City. Anne Brontë's novel The Tenant of Wildfell Hall (as "by Acton Bell"). Edward Bulwer-Lytton's epic fantasy poem King Arthur (1848–9). Charles Dickens' Christmas novella The Haunted Man and the Ghost's Bargain. Elizabeth Gaskell's first novel Mary Barton (anonymous). Thomas Babington Macaulay's work The History of England from the Accession of James the Second, vol. 1–2. John Stuart Mill’s book Principles of Political Economy. John Henry Newman's novel Loss and Gain: the story of a convert. William Makepeace Thackeray's novel Pendennis (serialised). ^ Thomas, John (1971). A Regional History of the Railways of Great Britain. Vol. 6 – Scotland: the Lowlands and Borders. Newton Abbot: David & Charles. ISBN 0-7153-5408-6. ^ Cholmondeley, Rose (1998). "Chopin's visit to Britain, 1848". The Chopin Society UK. Retrieved 20 August 2017. ^ "Timeline 1826–1901". Prudential plc. Archived from the original on 13 August 2010. Retrieved 30 August 2010. ^ Ross, David (2002). Ireland: History of a Nation (New ed.). New Lanark: Geddes & Grosset. p. 313. ISBN 1842051644. ^ a b c Palmer, Alan; Veronica (1992). The Chronology of British History. London: Century Ltd. pp. 269–270. ISBN 0-7126-5616-2. ^ "Burning of the Ocean Monarch". Liverpool Mercury. 25 August 1848. Retrieved 14 October 2010. ^ Lassell, W. (1848). "Discovery of new satellite of Saturn". Monthly Notices of the Royal Astronomical Society. 8: 195. Bibcode:1848MNRAS...8..195L. doi:10.1093/mnras/8.9.195a. ^ Williams, Thomas J. (1950). Priscilla Lydia Sellon: the restorer, after three centuries, of the religious life in the English Church. London: SPCK. ^ Mumm, Susan (1999). Stolen Daughters, Virgin Mothers: Anglican Sisterhoods in Victorian Britain. Leicester University Press. pp. 6–9. ISBN 0-7185-0151-9. ^ "Icons, a portrait of England 1840–1860". Archived from the original on 17 August 2007. Retrieved 13 September 2007. ^ Drabble, Margaret, ed. (2000). The Oxford Companion to English Literature (6th ed.). Oxford University Press. p. 147. ISBN 0-19-866244-0.